I came to join the mission of “Kairos” because two women in my parish wanted to be involved with the Kairos prison ministry. Kairos means “God’s time.” The mission is to bring Christ’s love and forgiveness to all incarcerated individuals and their families and to assist the incarcerated in the transition to becoming productive citizens. My gifts are compassion, love of the Lord, and teaching. I have a mission to take God’s love and message to the prisoners. Denver Women’s Correctional Facility currently has 976 prisoners and is the second largest prison in the state of Colorado. I am a volunteer chaplain there, serving two half days each week. Kairos has a progressive plan of four spiritual encounters spread over three and half days. On day one, participants have their encounter with Kairos; on day two, they encounter with themselves; and on day three, they have an encounter with Christ. On the last day, they have a half-day encounter with others. After that, we keep the Kairos community alive by coming back to an instructional reunion, having weekly prayer and share in fellowship, reuniting monthly, and having a two-day retreat where team members shared their learnings and insights with the inmates in small groups. I also work with a team of about 10 lay women who come in to work with the prisoners in one-day, two-day or four-day workshops. During these workshops, prisoners learn what it means to be a Christ-follower. Prisoners ask for bibles. Although there are other bibles available, we have learned that a simple-to-read bible titled “The Message” speaks most clearly. With so many women in the prison, there is a huge need for more bibles all the time. We have discovered they love the bright-pink, soft-bound bible we can order. We believe it is a bright spot in their drab environment and pray it attracts them to open the pages and really discover God’s love for them in there. Since joining Faith, I have been able to give 1,037 bibles to prison inmates thanks to the donations of many who believe in this mission. Volunteers: We have 60 people working with Kairos in the state of Colorado, and we always need more volunteers! Donations: We need funds to purchase more bibles. 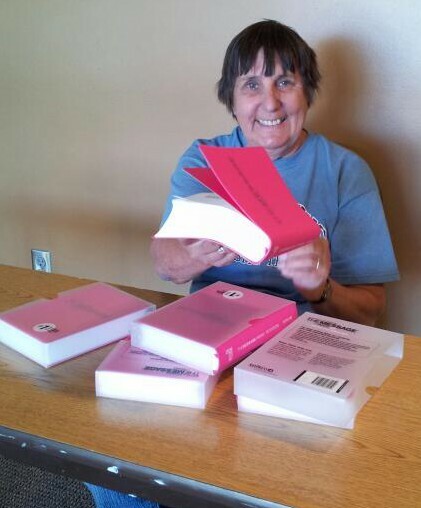 A case of 20 of the pink, soft-bound “The Message” bibles costs approximately $500. Donations of any size are always welcome. Send to Faith Lutheran Church and mark “Prison Bibles” in the memo line. Prayer: Pray for Kairos and for all the women we work with.